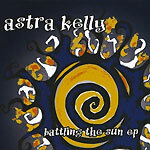 Turbula - Music - Review of "Battling the Sun EP"
Astra Kelly's latest EP  apparently her first recording in six years  opens with as hypnotic a power rocker has ever come out of San Diego. "Alright" is, in fact, one of the best songs by a local San Diego band. As in "ever." Great hook on the refrain, clean mix, a main theme you can hum to. Oh, and Kelly's got a powerhouse vocal delivery that seals the song's perfection. The rest of "Battling the Sun" shows that the longtime host of KPRI's weekly local music show (who handed the reins to Cathryn Beeks last year to focus on her own music) has spent her time productively. "One and Only" is a muscular rocker, reminding more than a little of East Coast rocker (and one-time Springsteen protege) Carolyn Mas. She changes gears on "All I Got," a dance-ready urban pop number, more Britney Spears than Joan Jett. And the title song is an acoustic singer-songwriter styled ballad, while "When the Night Ends" is a jazz-tinged pop song. No matter her stylistic forays, though, Kelly sings every song with strength and passion. When she's on top of her game, as with the opening track, she's as good as it gets in pop music. Even when she's not quite there, she still provides a solid listen.